When travelling on family holidays it’s RUFF to leave your furry friends behind. 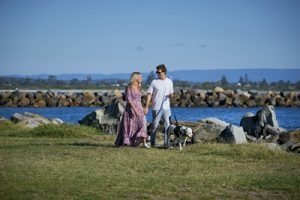 Lake Macquarie is the paw-fect pet’s paradise with thirty dog exercise areas, including designated beaches and sportsgrounds where dogs can run free, as well as pet friendly accommodation for longer stays. Lake Macquarie opened its first fenced dog park earlier this year and it’s sure to get tails wagging! The new facility located in Speers Point Park provides a 10,000m2 fenced, off-leashed area complete with 3 dog agility stations, a water fountain for both pups and their owners, a shaded picnic table, bench chairs and of course plenty of green grass for your pooch to enjoy. Just a short stroll around the corner you’ll find Sal’s by the Lake where you can grab yourself a delicious coffee and a beagle… whoops, we mean bagel! In an idyllic location for you and your pooch at the northerly end of a stunning nine-mile coastal stretch. This is the perfect spot for chasing waves (the dog, not you) and to enjoy panoramic views on an off-leash stroll. A favourite among the local humans and dogs, Blacksmiths Beach is one of Lake Mac’s top swimming beaches. Get the family together, pack some sunscreen, lunch and your pups’ favourite ball, and enjoy the warmer weather at Blacksmiths Beach. A firm family and four-legged friend favourite, and with good reason, Hams Beach is located at the northern end of Caves Beach. With rock pools aplenty, this is the perfect spot for off-leash exploring with your loveable mutt. Just a short stroll from one of New South Wales’ best-loved, off-leash beaches, Blacksmiths Beachside Holiday Park boasts beautiful grassy powered and unpowered sites suitable for your fur babies outside of school holidays and other peak periods. Blacksmiths is the perfect base for lengthy strolls with your pooch, or just kicking back and enjoying the long summer days by the campsite (please note restrictions to some dog breeds apply). Idyllically tucked between pristine beaches and serene Lake Macquarie, Belmont Lakeside Holiday Park is exceptionally located for creating a fabulous family adventure which your furry friend can join too. Your pup is welcome year-round on all sites so they won’t feel like they’re missing out on all the fun. Not only is Belmont Lakeside Holiday Park a hound hotspot, it’s been nominated as a 2018 finalist for the Caravan and Camping Awards of Excellence, so it’s worth seeing what all the hype it about! Marmaduke, Lassie or Scooby-Do)? Aurora House is the paw-lace to be! The newly renovated home sleeps up to 8 people and allows your pups to come inside and be close to their favourite humans. Just be sure to let the owners who there will be some extra children (dogs) joining the holiday and they are kept off carpeted areas and furniture. Looking for a place where your pup can run wild? Selby Lakeside Cottage has a large, fenced, grassy backyard and a stunning outdoor setting to sit back and enjoy the entertainment, creating a pet’s paradise. The 2-bedroom cottage has previous guests raving about how perfect this home was for their doggies, making it clear there’s absolutely nothing to be sniffed at here.